The Zinus Hybrid Green Tea Foam and Spring Mattress is a very "budget friendly" mattress -- one of the least expensive on Amazon! (I got the 8" variety) -- In this post, I'll give you my impressions! Watch My Video on YouTube, or read on for more details! density foam. The next layer down is 1" of visco-latex foam (I'm not sure if that means it's actually latex, or just latex-like), and then under that we have 6" of springs. These are not pocketed coils, this is just good old fashioned springs. The kind that's all pretty much just one big interconnected base. Next up is a 2" comfort layer that is likely intended to be a transition layer. It really squishes down and helps with responsiveness a bit. I should mention the "Green Tea" in the name indicates that the bed is infused with "Green Tea extract and castor natural seed oil" for odor elimination. I didn't notice any benefit to the freshness/smell from this aspect, but maybe it's present after several months. I'll be quite frank here . . . is this a good mattress? Well, it wasn't for me. At best it's "fair to middlin'," and that might be speaking kindly. The only outstanding thing about this mattress is it's price tag. It's one of the least expensive ones on Amazon, and the least expensive one I've personally reviewed. My childhood goes back to the 80's and this reminds me of the type of mattress my peers and I would have had as kids. The kind you could bounce on and catch air. Before most average folks had even heard of memory foam. They call it a "hybrid," but let's be honest -- this is an innerspring mattress. The whole thing just felt somewhat cheap to me. Right away, upon unboxing, there were several loose threads around the edges. The sides feel kind of plastic-ish. There is some noise. It's not overwhelming, but it's there. Not "squeaky," but when I first sat down, I could hear the springs moving around. If I changed positions suddenly, I could hear that too. There is zero foam or sound dampener around the edges. While the reports of some reviews on Amazon of the smell seem to be greatly exaggerated, it does smell pretty "not good" when you first unbox it. I let it air out for a full 3 days before sleeping on it, and it was a very mild period of winter days in the 50's, so I left the window open a crack for most of 2 of those days. By the end of the 3rd day it was tolerable, but it was a full week before the smell was really gone. At first it smelled like a chemical smell, but after 3-4 days it just smelled kind of rubbery. If you are at all sensitive to smell, don't plan on sleeping on this mattress for the first 3-4 nights. The cover doesn't feel too bad, but nothing special, either. It's just kinda functional. There's no way to sugar coat it -- don't plan on sleeping in the bed with someone else unless you want to hate them by morning. It's so stiff you will feel each and every thing they do. It's really just a big bed of springs, and the 1.5 inches of comfort layers just isn't enough to absorb motion. My wife and I laid on it together for just a couple minutes, and her comment was "it feels like a swaying ship!" (anytime I moved). I can only talk about it from my point of view -- as a full-sized guy - and I have a fair bit of curve in my back. This is a firm mattress. The 1.5" of padding above the springs just isn't enough to "fill" the space in my lower back, so it had too much of my support being transferred to my hind end when I sleep on my back. Sometimes people equate firmness to supportive, but that's not really accurate. This is firm, but not like sleeping on the floor firm -- it's like sleeping on a thin piece of wood that's held up by lots of springs and a little bit of fabric. Although "firmness" doesn't do a lot of justice to describe things, if you were to ask me how firm it is on a scale of 1-10 (with 10 being the most firm), I'd say this is in the 8-9 range. The edge support is very lacking. There's just not enough there for a 200+ pound person in the comfort layer. My body sinks through that top 1.5" of comfort layer like it's nothing. And this is what caused me to truncate my sleep test. I intended to sleep on it for 3-5 nights, but I only made it 2. When I slept on my back, my hind end and the shoulder blades would hurt. When I slept on my side, it was a little more tolerable, but my shoulders and upper arms would hurt. I woke up in the middle of the night both nights uncomfortable and took a couple ibuprofen to get back to bed. At the end of the second morning, even my armpit area - kind of wrapping back around to the shoulder blades - was sore. I'm never sore there. Conformity is the idea that the mattress is even -- without lumps -- and is locally conforming to your body without it being a global conformity. Actually, this aspect was better than I thought, it did stay pretty level with my wife and I laying on it, despite our weight disparity. And, the little bit of dip there was didn't spread out too much. Just kinda medium. I would have liked to have sunk in a wee bit more, though. I don't want to feel enveloped, but I felt too much like I was just laying "on" the surface. In full disclosure, I didn't interact with customer service at all (I ordered it online and never spoke any humans and never had to email anyone). I had no issues with the delivery, it came in the usual 2-day time frame. So, I had to rely on online opinions and Amazon reviews. There are a large handful of "major complaints" out there on the interwebs about people who wanted to return the mattress but could not reach anyone, never got a reply to their emails, etc. I guess I need to balance the good with the bad, and I'll go right in the middle here at 2.5. If I get comments about people with good experiences for exchanges, returns, etc., I'll be happy to raise that later. Shipping is free regardless of a purchase via Amazon or via the Zinus website. My purchase was on Amazon, and since I'm a prime member, it arrived 2 days after my order. On 01/11/2019, I wasn't able to find the mattress on the Zinus Website. However, I know I've seen it there before. Maybe it just sells out frequently. All Zinus mattresses are covered by a 10-year limited warranty, per the manufacturer's website. As you likely know, on Amazon you can return almost anything. I've seen a few reviews from people who returned a mattress. You have to buy a very large mattress box (you're not getting it back in the original box!) and then send it back the "regular way" with a pre-paid label. You will have to notify UPS or FedEx it's a large item, then arrange pick-up. Some places I've seen have said they will reimburse you for the special box, others said they won't, so I'm not sure on that. Obviously, most people just give up and don't bother. This has to be done within 30 days. On the date I wrote this (01/10/2019) I was not able to find return info on the Zinus website. It was a full 8" thick. price goes up the thicker you buy, with the most dramatic jump between the 8 and 10 inch variety.) There is one Amazon listing for all three sizes, which you can toggle, just like you can toggle the size (full, queen, etc). It seems that in general, the thicker ones get better reviews. To me, this is pretty obvious. I'm guessing adding 2 or 4 inches of comfort layer makes a BIG difference. In fact, the #1 Amazon review is a lady just raving about how much she loves the 12 inch she and her husband bought! So, maybe if I tried the 10 inch or 12 inch I would have a much better impression. I probably would. But I bet most people are buying the 8" because of the much lower price. Who knows, maybe if my YouTube video gets a lot of views and this blog gets a lot of clicks, I might try the 10 or 12 inch in the future? 1) People who have been sleeping on a bouncy, innerspring mattress for so long that they just can't envision going to an all-foam or hybrid mattress. If you just like really old-fashioned, spring mattresses, then this is for you. I understand that budget it a legit concern for a lot of people, so I don't want to "poo-poo" spending an extra $45. 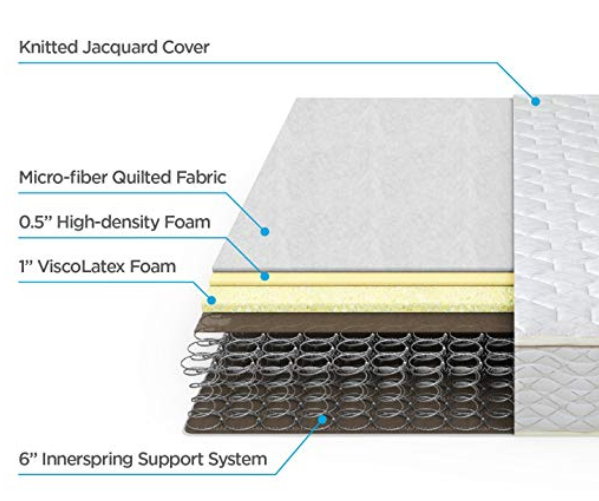 However, if you are looking for a highly inexpensive, mostly spring mattress, might I suggest the Signature Sleep Contour Mattress instead? I did a previous review of that one (see it here! ), and would deem it to be a much better mattress for roughly $45 more. Again, prices can and do vary, so always check for yourself. If you do go with it, I would give strong consideration to adding a memory foam or latex topper to this mattress to allow a little more "give" and pressure point relief. If you decide to try out this mattress through Amazon, I would really appreciate it if you use one of the links on this page, as it helps out my blog and YouTube channel just a bit! You can also buy it on the manufacturer's web site, and there may be other options as well. As I mentioned earlier, I have seen this mattress for sale on Zinus.com directly, but it appears to be sold out there at this time. I paid full price for my Zinus Hybrid Green Tea Foam and Spring Mattress. Some links on this blog are considered to be "affiliate links" (such as the links to products through Amazon) and I am paid a small referral fee if you click one of these links and subsequently make a purchase. This costs you nothing. I also participate in a refer-a-friend program through Zinus that allows me to earn gift cards if certain purchases are made. All opinions are my personal reviews and preferences, and do not represent the opinion of any particular company. Thanks for your consideration.